We run an Amazon Flip group that has a limit of 65 people. Many times when someone is considering joining the group people ask, “won’t the prices tank with 65 people in the group?” We cover that question in detail in our Amazon FAQ, but the answer in short in my opinion is Amazon Flips are much less likely to tank then an item you buy off an OA list with a limit of 10 to 15 or pick up at Target or Wal-mart on clearance. I believe in this so strongly that many time I buy Amazon Flips that I post in the Sourcing Simplifiers Facebook group that has over 4,000 people in it. One of the cardinal rules in the FBA Facebook world is never buy a BOLO that is shared in a large Facebook groups. I’ve even had people tell me they only join large groups like ours to monitor what BOLOs are outed and what NOT to buy. Now there are many instances in which I wouldn’t buy a shared BOLO; however, there are also many cases I would and I’d never dismiss and item just because it was posted in a Facebook group. 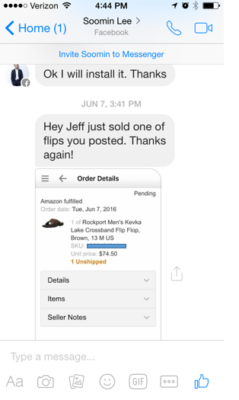 So let’s walk through an example of an Amazon flip posted in our Facebook group. 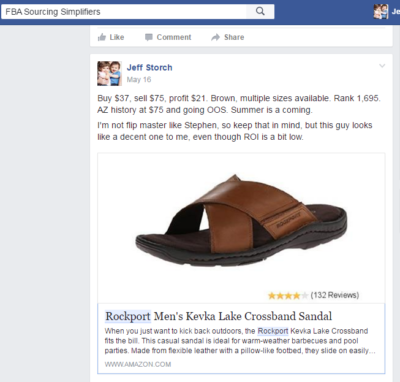 Here is a post I did on May 16th in which you could get multiple sizes of these sandals for $37. You can see by the orange line that Amazon was priced at $75 the day before. You can also see a long history of Amazon being out of stock with the item priced at $80 and short history of Amazon going in and out of stock with price ranging from the $37 to $75. Not in the keeps graph, but from the product page I knew the rank was great at 1,695, plenty of reviews (132) and only 2 variations. And best of all sandal season was just kicking off. All of that made be believe this would be a good buy so I picked up 3 of size 11 and 3 of size 12. So let’s look at the Keepa graph AFTER I posted this to a group of 4,000 people. Well the price quickly shot up to $80 because we bought Amazon out of stock. If you got your items in quickly before Amazon got back in stock then you likely could have sold the item at $80. You can see since May 17th you can see the price only dipped below $60 for a short period of time. Its unclear to me if that price drop was driven by a 3P seller or Amazon, but either way it very quickly rebounded to the $75 range which is the price this flip has been at most consistently since I posted the flip. You can actually see in this chart that the price has actually been more stable at a higher price since we posted the flip then before. So the chart looks nice, but did these sell? Well you can tell by the offer Keepa graph that the offer counts rose and fell over the two month period after the flip was posted and now there is only one person left selling these guys for $80 (actually selling MF for $80+$10 shipping). Based on that I can only assume that anyone that bought the flip in size 12 has already turned their money around. Also of course I know within a month of these hitting the Amazon warehouse I had sold all 6 of them for a nice profit of $120+ ($20+ each). I also know I wasn’t the only one that made some quick cash on these, as at least one other Admin, Assad Siddiqi, banked a quick $120. And I’m sure quite a few group members did it. I got this message from Soomin Lee from our group just a few weeks after I posted, thanking me for the flip which he had already sold. In all he sold 5 for a nice $100 profit. Don’t get me wrong, not all flips or public BOLOs work out as beautifully as this one. Like anything you buy with the intent to sell on Amazon, there is a chance it will tank or sell slower than you like. However, in my experience I’ve seen a lot less tanking with AZ flips then I’ve seen with other OA items. How about you, do you ever buy the AZ Flips we post in our group or are you on the side that avoids all BOLOs at all cost? This entry was posted in Amazon Flips, Fulfillment by Amazon (FBA), Online Arbitrage and tagged Amazon Flips, BOLO. Bookmark the permalink. I don’t mind buying them at all as long as you can see that they are selling a decent amount a month from the keepa chart! And also, not all 4,000 of those members are going to get the deal because there were probably less than 100 in stock at that price I would guess.